Flax seed is high in lignans, a type of phytoestrogen that is thought to balance estrogen activity in the body; omega-3, an essential fatty acid which is known to lower blood cholesterol levels; and both soluble & insoluble fibre which help to reduce cholesterol and aid in digestion. Our certified organic Flax Seed is non-GMO and processed in nut and peanut free environment with no traces of soy or dairy. Omega-3 essential fatty acids play a role in every cell in the body. Omega-3’s makes up cell membranes, keeps the nervous system functioning, keeps cholesterol levels in check, and staves off inflammation. Once Omega-3 is in the body, it also gets converted into the fatty acids DHA and EPA. Not surprisingly, flax seed tops our list as the best vegetarian source of Omega 3. One ounce of flax seeds packs in 6388mg of Omega 3. You get 1655mg of Omega-6 in the process, which helps keep your Omega-3 to Omega-6 raios in check. To get an even bigger boost, you can take a tablespoon of Highwood Crossing organic Flax Oil which delivers 7196mg of Omega-3. 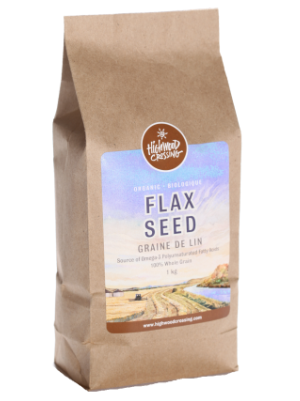 Flax Seed, a crop that grows well in the Prairies, comes in both brown and golden varieties. Both colours of flax seed have plenty of protein, dietary fibre, and alpha-linolenic fatty acid (ALA). While some people prefer the yellow-coloured seed, brown flax seeds have the same nutritional profile and provide the same beneficial nutrition to the diet. The brown variety of flax seed has the added advantage, however, of being considerably less expensive. Flax seeds include heart-healthy fats, both types of dietary fibre (soluble & insoluble), and health-promoting plant compounds known as lignans. Flax seed is a wonderful source of an essential fatty acid called alpha linolenic acid (ALA) – a type of omega-3 found in plants. This omega-3 fat helps prevent heart attacks by reducing the risk of potentially deadly blood clots, as well as abnormal heart rhythms. The tiny, tasty seeds are a wonderful source of both water soluble and insoluble fibre. Water-soluble fibre has been shown to lower cholesterol and triglyceride levels, and stabilize blood glucose levels by slowing the absorption of sugar in the digestive tract. Insoluble fibre helps reduce the risk of intestinal cancers and keep the intestinal tract humming along nicely. Fibre also helps us feel full longer! Flax seed is a rich source of plant estrogens called lignans. Besides acting as an antioxidant, with potential benefits for artery health, lignans are thought to protect against hormone-sensitive cancers such as those of the breast, endometrium and prostate. The lignans act as phytoestrogens – phyto meaning plant – and can interfere with how estrogen works in the body, in some cases countering estrogen’s effects. Try our most popular bread recipe – developed for the artisan in you! Combine the warm water, honey, oil and yeast in a large bowl, cover and let sit for 10 minutes until frothy. Add the salt, flax seed, sunflower seeds, rye flour and whole wheat flour to the wet mixture and mix well with a large spoon. Add the all-purpose flour to make a workable mass. Knead the mass into a ball of dough. Swoosh flour mass into a round-ish shape with both hands, kneading and turning dough a quarter turn as you go. You may need to dust the counter with a bit more flour as the dough may stick to the counter. Keep kneading for about 8 to 10 minutes total time. Put dough into a large oiled bowl. Roll dough in oil to cover the whole surface and cover bowl with lid or cloth. Let dough rise in a warm, draft-free place for about 1 hour or until doubled in size. Some people put dough in a clear plastic container with a tight-fitting lid and put a mark on the side so they know when dough has doubled. Grease or oil two 9×5 inch bread pans and have ready. Deflate the dough by pressing your fists into the risen dough. Turn out onto lightly floured counter and divide into 2 piece. Tuck the rough cut side into the dough and shape with your hands into a tight oval shape. Set into greased pans. The loaves now need to proof until double in size, usually about 1 hour, but it depends on the temperature in the house. Set them on top of the fridge for extra warmth. Preheat oven to 375ºF. Once loaves have doubled, bake for about 30 to 40 minutes or until golden and when tapped on the bottom of the pan, there is a hollow sound.